It's early Sunday morning and I am supposed to be sleeping in. 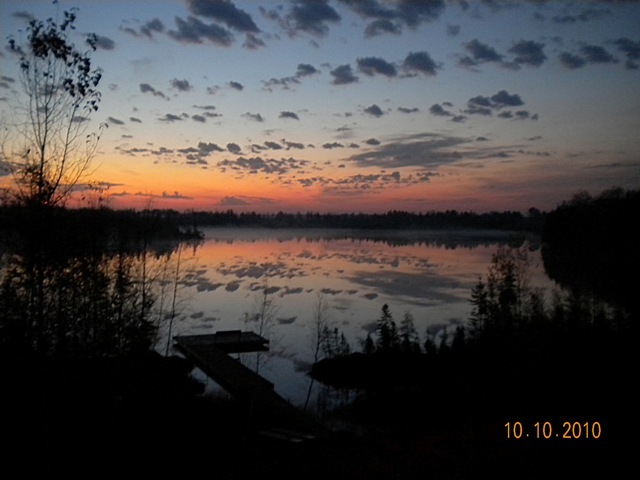 The view of the lake this morning is worth more than an extra hour of sleep. It's a good time to stop for a minute, have a cup of coffee, and reflect just like the clouds over the lake this morning. After all, our motto at Bornemann's Afield is "The Pursuit is the Reward". We created all this to share with family and friends what we feel are some of the important moments in life. The 2010 whitetail season is just three weeks old and a lot has happened. I bagged my largest whitetail with the bow with my brother Brian over my left shoulder. That was a great experience. But, I already topped that experience yesterday in a blind with my brother Jeff and my nephew Jake. 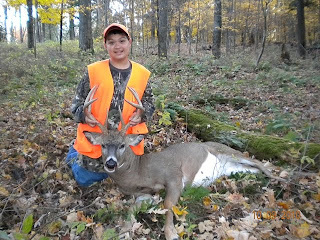 It was Jake's first ever whitetail deer hunt. 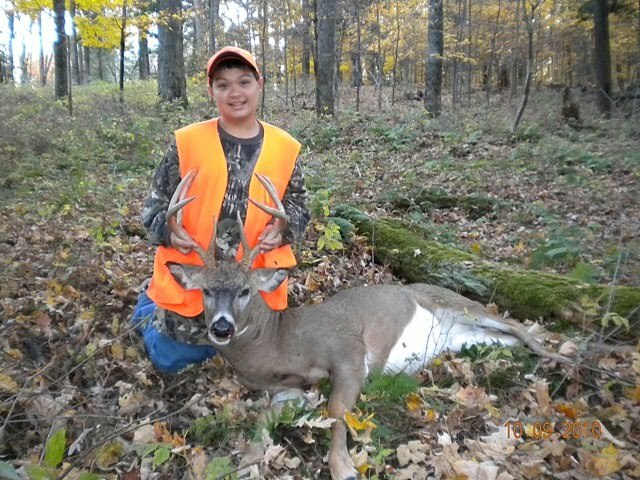 Wisconsin's Youth Hunt program has been a bit controversial, but I, for one, witnessed first hand what impression it can make on a ten year-old boy. What a satisfying moment for Jeff and I, introducing the 4th generation to the whitetail woods. In his first ever hunt, Jake experienced the excitement of seeing his first deer (a doe) and the periods of quiet "boredom" which every hunt includes. About 2-1/2 hours into his first hunt, the quiet ended, and the excitement began. A tall 8 pt appeared directly in back of Jake. As the three of us sat and contemplated how to get Jake turned around for the shot, the big 8 pt made our decision for us. He was headed straight for us. He was so close we could hear him munching on ferns as he passed 3 yards to Jake's left. As he cleared the blind and walked past us, Jake raised his rifle and settled in for a shot. What a thrill to hear Jake's breathing intensify and to hear him say "I am Ready". With that, Jeff slid off the safety. Jake took a breath, held, and pulled the trigger. The shot was perfect. The big 8 pt made it less the 25 yards and fell stone dead. What a great sense of pride he felt. His dad and uncle felt even more. What a great experience for a 10 year-old boy. What great lessons learned: patience, responsibility, accomplishment, handling a gun safely, and taking a wild game animal ethically. You could see the pride on his face. Jake's 8 pt will adorn his wall for a lifetime as a reminder of a great day in the outdoors. THANK YOU JAKE! Welcome to the Team.